No, that's not a typo in the post title; it's not brushes! Brusho is an intensely pigmented water-based paint powder available in various colors. It's easy to use, and fun because you never know exactly how it's going to turn out. It's a surprise every time! The easiest way to use it (I think) is to heavily mist some watercolor paper, choose some colors and then sprinkle them on randomly. If you want, you can spritz extra water on to make the colors run more. This would be great for the emboss-resist technique! After it's to your liking you can let it air dry, or speed things along with a Heat Tool on the low setting. Now for even more artsy-fartsy fun, dip your fingers in water and flick some droplets on the dried paper. Let it sit for a minute and then blot the drops off. It removes some of the color and creates a neat Bokeh effect! 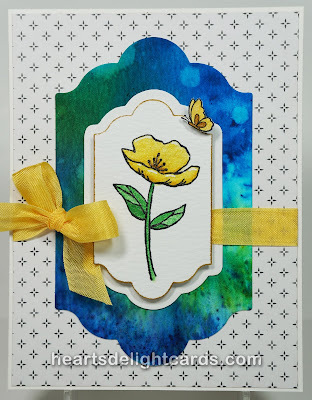 As you can see, I'm still loving the Birthday Blooms stamp set. 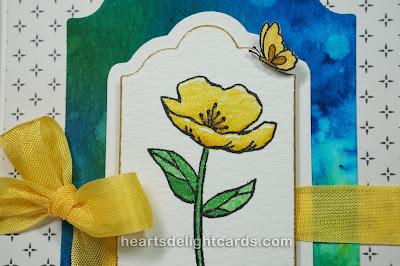 This time I used the smaller single blossom, stamped on watercolor paper and colored with a a blender pen and ink pads. Of course, I had to add a little sparkle with some Wink of Stella on the flower and its visitor. 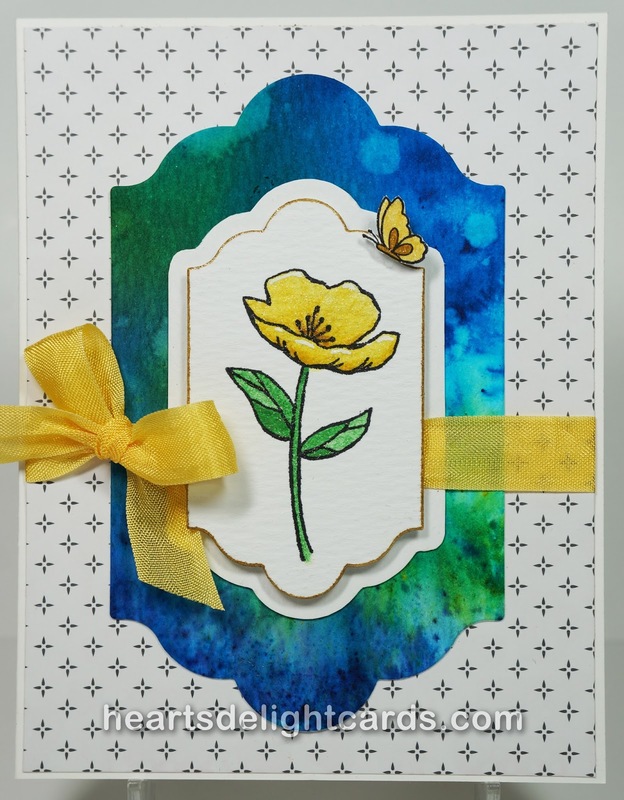 That tiny butterfly is from the free Sale-A-Bration set called Flowering Fields. Isn't it a cutie? After the flower image was die cut, I treaced around the outside of the die to create a mat for the image. If you look closely, you can see the edges of the flower panel are edged in Gold Wink of Stella - really makes it pop! So lovely! I need to play with my Brushos! Heidi, other than checking them out when I first got them, that was the first time I made anything with them. Play with yours - I want to see what you make! What a dramatic backdrop for your image - lovely. Where do you get the brushos? Thank you, Mary! I got the 12 piece set on Amazon. Now I think I need more colors, lol!